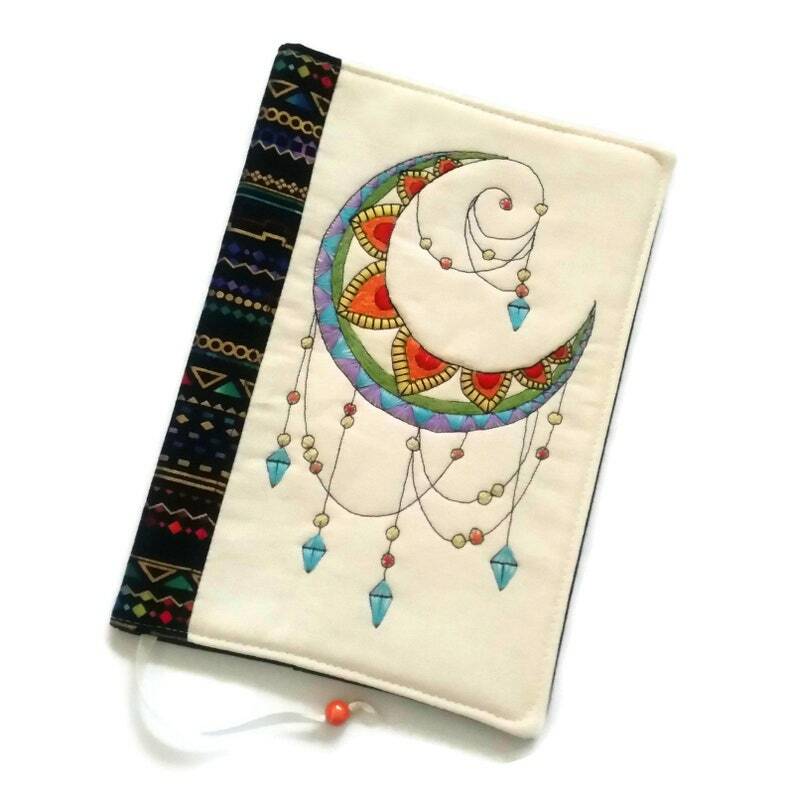 Handmade fabric book cover with hand embroidered mandala made of high quality cotton fabrics. The cover is machine-sewn and hand stitched. All the different colors are hand embroidered. It’s fully lined with a black cotton fabric. It has a bookmark made of satin ribbon and bead. It‘s lightly padded for structure and durability and it's reusable from book to book. This cover will protect your favorite books and your privacy while reading in public. It will give a beautiful look to your book and will inspire your readings! It is a great gift for women or man and all book lovers. It measures 23 cm high and 33 cm wide, which makes it a perfect fit for a 400 page A5 book, journal, diary or something slightly bigger. Hand wash cool. Lay flat to dry. This fabric book cover has been designed and handcrafted by myself in my smoke free and pet fee home studio with great attention and care. Please Note: Beads and Pattern placement can vary slightly from the photo shown, because each cover is made from different parts of the same fabric. If you are interested in buying this item please make sure you read and agree to my shop policy. If there is any more information you need - please just ask! I can make a custom design to fit your own book, just contact me and let me know your book's dimensions: height, width and the depth and I'll make you a custom order. Please measure carefully and accurately, as these book cover will be designed to have a slim, close fit. Such a sweet and well made cover. It makes me happy every time I see it!! Beautiful and functional. Great for kids and an artist on the go! Absolutely gorgeous! The detail is amazing! This cover is great, very good handmade work, theres nothing that could be better! And Svetoslava is such a friendly person who gave her best to make everything possible I wished for - I would definetly by at her shop again! The order needed approximately one week to come to Germany, not more. 5 stars is still not enough, if I could give more I definetly would! Thank you, Svetoslava!